Decimus 4 is coming together but lost a little smoke today. The motor driver MOSFETS are full-bridge devices and would normally have their gates drived directly from the MAX4427 gate driver. That means they would always be at one rail or another and either the top or bottom MOSFET will be on while the other one is off. With the gates floating, there is no guarantee about which MOSFET will be on and they can both be partially on. The result is potentially large currents flowing through the motor driver even without the motor connected. And tendrils of smoke gently wafting up from the devices. Fortunately, the smoke seems to have just been hot flux and the power supply I was using went into current limit at 800mA. Without the current limit, the outcome could have been much worse. Nonetheless, the motor drivers may have sustained some damage so it would be best to replace them. Without the gate drivers in place, the temporary solution is to short all the driver gates to ground so that I can continue developing code with this board while I wait for some new parts to arrive. That will ensure that one MOSFET in each half-bridge is firmly off. So – until you are certain everything is correct, run from a current limited power supply and never, never leave the gates floating on a MOSFET half-bridge. But you already knew that. So did I but I rushed it anyway. While testing, I have screwed the board to a piece of perspex as a precaution against shorts on my normally cluttered desk. I have quite similar experience with MOSFETs, but we had there 6 cm high bright flame – because of running from Pb battery. The problem is the same, gates hadn’t defined state. Just use pull-downs on gate mosfets. Just for curiosity, what value and voltage are the three tantalum ? Are you splitting the digital and analog ground? If i remember in the forum i read that you use eagle, as me, how do you split the signal in eagle? The two grounds are split. In Eagle, I have a part that consists of two surface mount pads. One pad is digital ground and one pad is analog ground. They are joined by a wire in the package but are otherwise separate. Eagle just treats this as two nets and they are automatically joined on the layout. Can you share the eagle part? I think I used the 2-pin jumper part from the Sparkfun library. 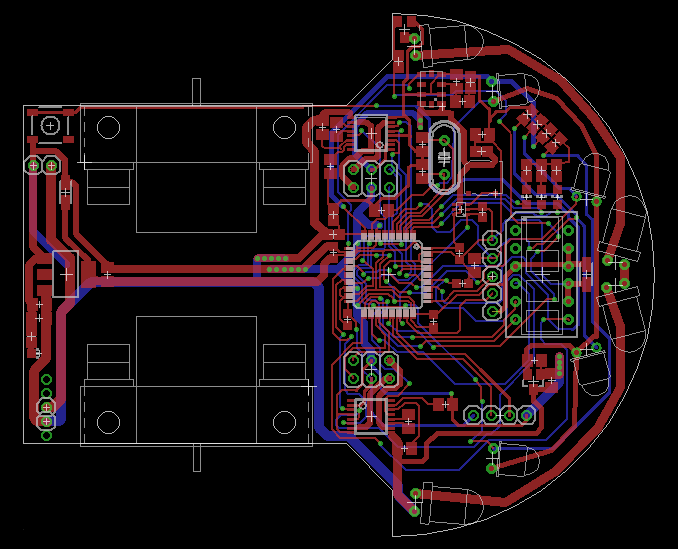 It has a variant that will short out when reflow soldered. Since it is from their library, it would not be appropriate for me to post it here. Thank you… can you tell me what connector you use for the battery and the motors? The motor connectors are JST PH series 2mm pitch and the battery connector is a JST XHP2 2.5mm type. I should have used the PH series for both but wanted the batteries to be useable on another base I have. – When I switch the connectors and turn the left motor, on the right driver, and vice versa (right motor on the left driver), still each one separately. Everything works. – When I turn both motors on, they try to budge, but they both turn off… I’ve added lots of caps (like 200uF before and after the 3v3 LDO) along with my 7,4v lipo battery. And the thing still happens. Do you know what might be the cause? Is it really the power? I’m trying to run both motors with 750/4096 pwm, and still this happens. Do they work at lower PWM levels? Put a voltmeter on the battery terminals and see what happens to the battery voltage when you drive the motors. Make sure that it really is the battery that is providing the power to the motors and not one of the regulators. Do you have an oscilloscope? If you do, disconnect the motors and look at the signals on the drive and make sure they do what they are supposed to. You may have a wiring error in your board. Trace all the signals carefully. It may help if you can provide either a schematic or code. Or both. The max current output will be limited by the LDO regulator you use, and dropping voltage from 7.4V(8.4V max actually when fully charged) to 3.3V to feed a application with a power hunger application(such as the motor, which is the one drains the most power of your system) will be very efficient for the power usage for such as system. I also noticed you mixed your digital/analog/motor ground almost together on the top half of your PCB, also the power trace wasn’t consider be thick enough if you have more space available on your board. On the other hand, I really like your work to make the thoughtful motor mounting system. it looked so elegant and is always what I dreamed with! wish you best luck afterall. It’s really an embarassment for me, cause I really thought I knew what I was doing. I didn’t make any simple mistakes as Peter mentioned. Every voltage is good etc. The only thing I didn’t do was make the design robust. I’ve added every ceramic cap needed of course, but I scarced on bigger caps, cause of their size. I thought one 100uF just after the LDO would be enough. Apparently it is not. I have made some improvements by adding more caps, but the problem is still there. I’ll be checking it out at work tomorrow on an oscilloscope and keep you guys updated. I don’t think this is about capacitor, since I saw someone only put a 10uf CAP on motor driver and performed pretty well at competition with faulhalber 1717 006 motor at APEC. May be having a schematic here for your mouse will be good for us to diagnose the problem your mouse has. What’s the discharge for your battery? the motor will shut off when accelerate too hard if the discharge rate for the battery is too low. I had this issue at beginning by choose some low discharge rate battery ended up had the mouse powered off when motors spin fast. Then I parallel 2 batteries as one to maintain sufficient current output. Usually 20-25C batteries are what I suggested. The max current = battery capacity * discharge rate. For instance, a 150mah battery at 20C discharge rate will have 150*20=3000mah=3A continuous current output capability. I don’t know what exactly motor you are using, you may need to go check the spec for motor’s current consumption to decide how much current is need at 7.4V power supply. I also noticed since you use A3950 motor driver, a thermo-pad is always suggested under the IC to help keep charge balance and heat spreading.